Aim of this project is to create a collection of profiles of Irish gang members, please feel free to add anyone not already listed in this project. Irish gangs date at least to the mid-19th century when street gangs waged battles for control of New York City neighborhoods with colorful names like Dead Rabbits and 40 Thieves. A new kind of Irish gangster emerged during Prohibition in the 1920s when rival organizations fought for bootlegging and gambling operations. 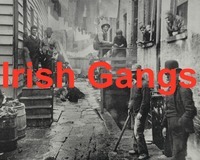 Irish gangs conducted criminal operations unrivaled for most of the 19th century until the 1880s when Italian immigrants began to arrive and established the Black Hand and later the Cosa Nostra. Jewish and Italian mobsters encroached on Irish bootlegging, dog racing and gambling operations in Chicago, leading to a bloody war that fostered the modern gangster. Italian mobster Al Capone planned the St. Valentine's Day Massacre on Feb. 14, 1929, in which six members of Bugs Moran's Irish gang and a bystander were killed in a dispute. Dead Rabbits, the 1850s, and originally were a part of the Roach Guards. Grady Gang, sneak thief gang during the 1860s. Kerryonians existed in New York about 1825, one of the earliest organized crime gangs. The members headquarted on Center Street (now Worth St.) at Rosanna Peer Grocery Store. The Kerryonians spent most of thier time mugging and beating up English. Marginals, also called the "Paddy Irish" gang, was a New York street gang during the early 1900s. Potashes, active in Greenwich Village and the New York waterfront during the early-to mid 1890s. Swamp Angels, dominated the dockyards of New York Harbor from the 1850s into the post-Civil War era. Until eventually they merged with the rival waterfront gangs into the White Hand Gang at the end of the century. White Hand Gang, was a collection of various Irish American gangs on the New York, Brooklyn, and Red Hook waterfronts from the early 1900s to 1925 who organized against the growing influence of Italian gangsters.